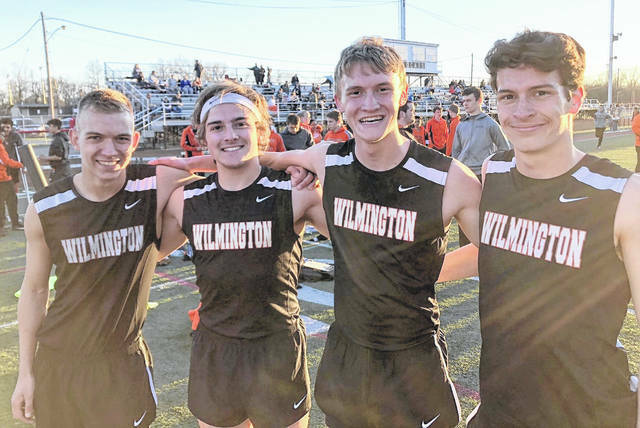 FRANKLIN – Led by the record-setting distance medley relay team, the Wilmington High School boys track and field team won the Franklin Relays Tuesday at the Lions Club Municipal Park. The distance medley foursome of Aidan Hester, Rory Bell, Josh Andrews and Simon Heys set a Franklin Relays record as well as a WHS record. Wilmington also had first-place finishes by the sprint medley, 4×200, pole vault, shot put, long jump, 4×400 and 4×1600 relays. The 4×1600 squad set a new WHS record of 19:36. The 4×800-meter relay was runnerup in its event.